Renovating and updating your home can be a costly and time-consuming project, particularly when it comes to bathroom remodeling. Fortunately, if electrical and plumbing updates are not necessary, there is a virtually limitless number of budget-friendly ideas you can use to transform a dull, drab bathroom and give it a fresh new look. Below are some tips on how to complete an affordable upgrade. Although it may seem like an overly simple suggestion, painting the walls with a fresh, trendy color and replacing your shower doors with newer models can go a long way toward updating the look of your bathroom. For an ultramodern appearance, opt for a two-tone paint job that will instantly perk up the room. Stained and worn out bathtubs can also be painted with special paint. Once this is complete, you can invest in new hardware for the tub, shower and sink. For example, you can switch out gold or brass faucets, which are now outdated, with striking metallic black glaze or bright paint. Install new lighting in the ceiling and over the vanity to instantly modernize this much-used room. However, fluorescent lights should be avoided if possible, as they can be somewhat harsh. Instead, try a natural, soft light in your bathroom. Even simple things such as hanging new mirrors above the sink or vanity can add a touch of class to essentially any bathroom. Choose a mirror with a stylish look and an interesting frame, or purchase plain mirrors and shop for frames separately to create an entirely unique look. Replacing old, scratched or worn tiles with new, contemporary pieces is a great way to make your bathroom look brand-new. 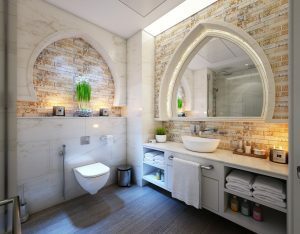 Try swapping out venting fans for quieter models to update your powder room, and clear out clutter through the use of stackable drawers and shelves, which are usually not expensive. When planning an inexpensive remodel, browse through magazines, shop around at home improvement stores and search online for decorating ideas. With a little time and effort, and affordable upgrade for your bathroom can become a reality. Very nice blog! Thanks for the ever wonderful and low cost bathroom upgrades. Truly, one can remodel the bathroom without spending too much.